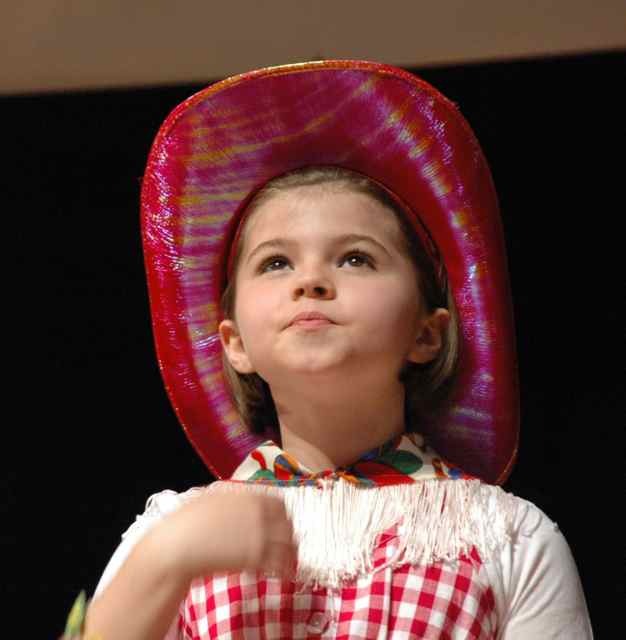 Every year we create an original musical, and the Garden Players kids get to inspire us and perform the world premier. Six of our musicals have been published and performed by hundreds of theater groups all over the world, including the Broadway Musical Theater Festival. Our musical We Are Monsters (published by Beat by Beat Press) has even been mentioned by Tony-nominated Broadway actor Patrick Meyers on Late Night with Seth Meyers. 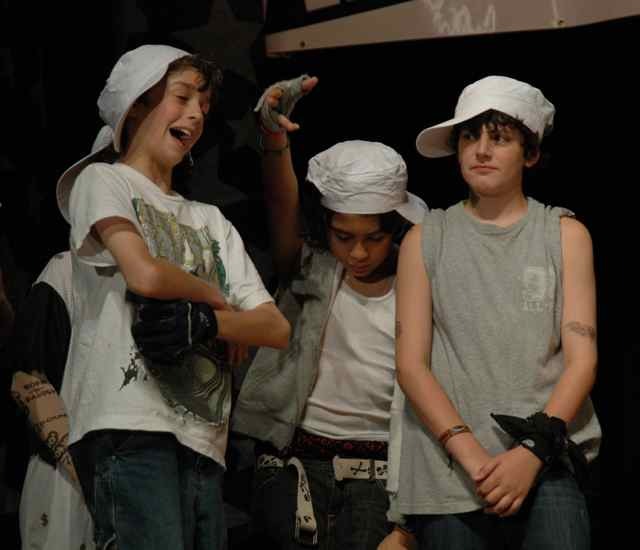 Original musicals… Every year we put on an original musical written for the kids in our group, inspired by the events and stories around us. Hear Sunny and Betina talking about how they created their shows, and see some of the highlights below. What If? Dress Rehearsal & Interviews... Take a look at the back stage view of what we do, hearing from the actors, director, musical director, and more. Actor Interviews… Sara of Little Comb Productions interviewed some of the Garden Players actors. Here is what they have to say. May 2018. What is it like working on an original musical? What are the difficulties and thrills of being a part of Garden Players? May 2017. What are the real benefits of musical theater? How do kids feel about themselves when they put on a show? Sara of Little Comb Productions interviewed some of the Garden Players actors. Here is what they have to say. The first semester our classes work on acting improvisations, working towards making big choices, trusting their instincts, working together as a group, and using their imaginations. Our Benefit Concert is usually held in January, and the students have 3 rehearsals only to prepare… an exciting and invigorating process. We have done concerts concentrating on Beetles songs, 1920’s jazz, and more. This video is from a year when the students performed a concert version of The Noble Gnarble, a 20 minute musical based on the childrens book of the same name. It’s incredible how much material they learned in just 3 hour long classes! The second semester the group puts on a fully staged and costumed original musical to packed houses. More than 5 musicals have gone on to be published by Beat By Beat Press and then performed all over the world. Here is the full experience of our 2017 premiere of Your Turn, A Superhero Musical! Click on the links below and you will see articles with wonderful photo spreads. Broadway World features our Garden Players in photos of Space Pirates! 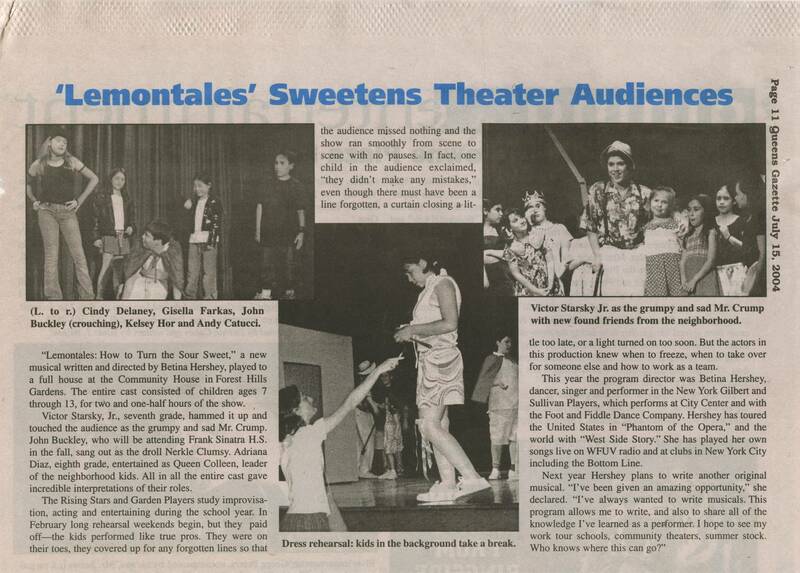 Space Pirates 2014 production had a wonderful article in the Queens Gazette written by Alena Gerst. Our Benefit Concert this January 19th, 2014, received a rousing review by Liz Mooney in Tower Topics. Thank you for all you do to make the Garden players such an amazing experience for our children. The show was just fantastic! Loved the story and the music. Please know that you give the children as well as their parents a lot of happiness. The gratitude we feel towards Lily for recommending Garden Players when Nate was six years old and towards Betina who has shared part of herself for a decade is always remembered and cherished. The lifetime benefits of musical theater that Nathan, Sophia and Austin have experienced are daily seen by us every time they: prepare for a class presentation, try out for a club, get through an interview, have a conversation with a new friend or an adult, and the best time when they come home to tell their tales. You’re the one who nurtured and inspired their creativity, letting them know that whatever they want to do, they can do. My favorite part of being in Garden Players is the originality and then watching the shows come together. The shows helped me be just a little more outgoing. People call me “thoughtful,” but that may just be code for “shy,” and so if anyone out there is also “thoughtful,” Garden Players may be for you! Stella is not what I would consider a natural extrovert, but she comes alive on stage. Her confidence, excellent public speaking skills, and delivery and timing are all a result of your amazing program. No matter what they end up doing in life, the confidence that you fostered and cared for will always be with them. They enjoyed every minute of every year and made many friends along the way. It has been a huge pleasure for us as a family to be involved with the Garden Players and I know our kids will continue to go back every year to help you with the shows. Raphy has learned so much and has such a good time with the other kids. Garden Players gave her a sense of self-confidence and poise. The games and singing and learning lines helped her memory. The interaction through improv forces her to think on her feet and be conscious of others. And…she has fun! In other words: Wow, has this been a great experience! Shea absolutely loved being in the play and still is singing and saying lines from the play every day. Thanks to you I feel Shea has found something she really loves and enjoys. I caught the opening performance of Space Pirates at the Community House. It was a wonderful show, lots of fun, well written and staged. Above all, the energy of the kids and their commitment to the make-believe fun, made it an unexpectedly rewarding evening. Really nice musical numbers too. So thank you for presenting such a fun show. When ever we play with thought of moving from the neighborhood I feel that the only thing that will be hard to replace will be your classes.